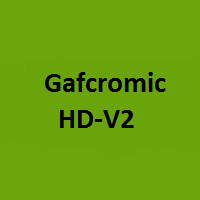 GAFCHROMIC HD-V2 is a radiochromic dosimetry film designed for the quantitative measurement of absorbed dose of high-energy photons. As a self-developing film, HD-V2 is a perfect fit for the processorless environment. Since radiochromic film requires no post-exposure processing, there are no chemicals to dispose of and the film can be handled and used without need of a darkroom.